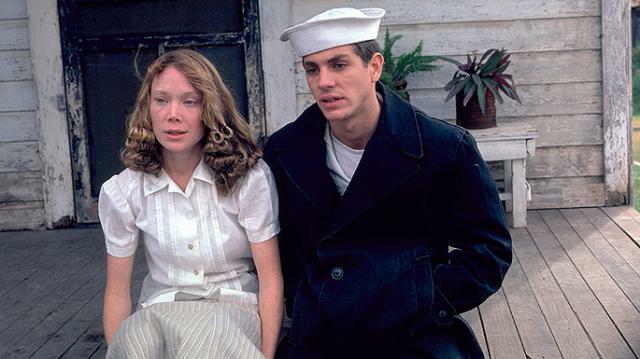 In real life, Sissy Spacek is from Quitman, Texas, which is somewhere in between Bright Star and Little Hope. (No kidding! pan out a couple of notches from this map and see!) As Nita Longley in the little-remembered Raggedy Man, she lives in Gregory, Texas as a divorced woman with two boys during World War II, working as the town’s sole telephone operator. Even though she wants a job with regular hours, her boss insists that due to the war she’s frozen in her position — which means she’s got to be close to the switchboard all the time. This sweet, romantic film makes for a perfect Saturday afternoon indulgence. Hey, it’s hot outside: pop a bowl’s worth of popcorn, pour yourself a tall glass of something cool and bubbly, and settle in (it’s streaming on Netflix). What an incredibly diverse actor she is. Just think of her in Badlands (1973), Carrie (1976), Coal Miner’s Daughter (1980), or Blast From the Past (1999). That strawberry hair, that perfect dainty ski jump of a nose; those wide eyes of an indeterminate grey-green color — somehow she’s been able to convey an enormous range of emotion beyond the hopeful innocence of the photograph above. She’s also magically ageless. After appearing as Loretta Lynn from age 13 to her 30s, Roger Ebert marveled, “Spacek at 29 has the ability to appear to be almost any age on screen. …[She] always looks the age, and never seems to be wearing makeup.” Even better that in Raggedy Man she appears opposite a young Eric Roberts at the height of his own surreal beauty. 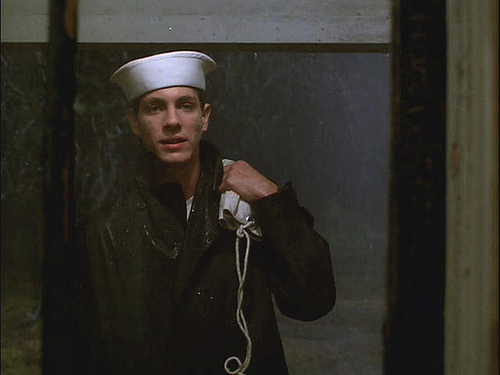 One rainy night, young sailor Teddy (Roberts) shows up at the house to make a phone call to his girlfriend back home in Oklahoma. He’s got a four-day leave before shipping overseas and wants to see her, but it seems his girlfriend never got around to sending that Dear John letter. Instead, Teddy stays with Nita and quickly wins over the hearts of her two boys, just the ages to admire a young Navy man. With that middy and flared Navy pants, who wouldn’t be won over? One of those boys is a young Henry Thomas, who appeared the following year as the lead in E.T. During the same year Raggedy Man appeared on screens, Roberts suffered a car crash that left him comatose and with significant facial trauma. Recovery changed his appearance enough that we’ve come to know him as a reliably scary bad guy in the movies — in big releases like The Dark Knight but also quite a list of B-movies. I’ll bet you $1000 that he’s having more fun in those roles than he would have as a perpetual prettyboy; but you can see in this film what a charmer he was, with that accent and bedroom eyes. Why not escape the weather outside and watch a couple of experts at work?